The American diet is rich in sugar, salt, fat, calories, and refined carbohydrates, and is extremely low in vitamins and minerals.This nutritional anemia causes obesity, and also increases almost every disease from Diabetes and Cancer to Heart Disease and Neurological Diseases. It causes rapid aging…you get older faster! Most people today live on a diet of overprocessed and overcooked food, not to mention coffee, sugar, chocolate, junk food, prescription drugs and alcohol. Our environment is more toxic, and has more chemical pollutants and less oxygen in it, than ever before. Most of us suffer from lack of exercise, lack of sleep and excessive stress. This constant bombardment that we call “modern living” devours nutrients like a raging forest fire with a 100-mph tailwind. A lack of nutrition in your blood can cause everything from low energy and a weak immune system to premature aging and virtually any disease. Nutrition is what builds every cell, every organ and every metabolic chemical in your body—it’s what YOU are made of. Having a rich supply of nutrition in your blood gives you energy, vitality and strength, protects you from disease and illness, and if you get sick, speeds up your recovery dramatically. SUPERFOOD PLUS is the most POWERFUL NUTRITION ON THE PLANET! 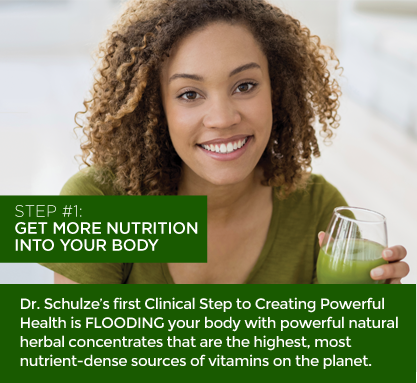 Dr. Schulze’s SuperFood Plus blasts your bloodstream with a rich supply of nutrients that increase energy, vitality and strength. Dr. Schulze created SuperFood Plus to SAVE lives. This is powerful nutrition from organic and wild-harvested, raw, vegan herbs and superfoods. No other superfood is this pure and this strong. These are rapid assimilation, rapid deployment, natural super foods that your body recognizes, assimilates and utilizes in minutes. Health, energy, vitality… look and feel younger! ✓ The ONLY high concentrate superfood with no synthetics! ✓ More ENERGY and VITALITY… Be more ALERT with over 500% of your daily Vitamin B12! ✓ Antioxidants are proven to slow, even REVERSE AGING! They help you look and feel younger! ✓ Blasts your blood and body with over 100% of every major vitamin! ✓ Powerful nutrition creates Powerful Health and promotes your body to repair and heal itself! ✓ Only 50 calories with ZERO fat! ✓ Created to SAVE LIVES! If you do only one thing, I need you to get more nutrition into your body. I say this because every single patient that walked into my clinic needed more nutrition. Increased nutrition is the first step for everyone to get well and build powerful health. Nutrition is what builds every single cell in your body—it builds this thing you walk around in called “you”! Nutrition builds healthy skin, strong muscles and bones, but it also builds, repairs and nourishes your heart, brain, lungs, nerves, liver, kidneys and every organ in your body. Nutrition also builds all the chemicals and liquids in your body from your hormones, brain chemicals and neurotransmitters to your blood and immune chemistry. 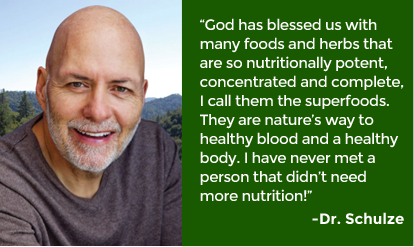 When I got more natural, high-density, easy-to-assimilate nutrition into my patients’ bodies, that’s when the miracles happened!